If you are reading this sentence, you are in the minority. Most became immediately disinterested when they noticed the title. If they noticed it. Of all the things to read online, who’s going to read a post entitled, “I Love to Read the Bible”? First, it sounds boring. Second, it must be a lie. Third, if it could possibly be true, it must be a super-spiritual thing that super-spiritual people say. While I can’t make the Bible appealing to you or fill you with a great love for it, I can tell you what’s true for me. I love to read the Bible. I love to sleep in and take my time getting ready for the day. I love to plan ahead and arrive early. I love watching my students succeed. I love proofreading and editing. I love babies and piano music. I love cottage cheese, cheesecake, cheese crackers, cheese puffs, and cheese. I love people. I love fall weather and all things pumpkin. And I love reading the Bible. I do not love all of these things equally, but I do love them. And yes, I love reading the Bible. I want to read it. I get excited about reading it. I prioritize it above other things because I would be sad if it were the other way around. I sometimes forget other things, but not this. And I sometimes spend a lengthy amount of time reading the Bible without even realizing it. Who does that? Super-spiritual people who are close to God and have nothing better to do? Nope. Because I would describe myself as a weak soul in need of grace. A sin-diseased saint in search of heavenly-mindedness. A typical citizen of this temporary land – distracted, busy, bombarded, pulled in every direction. A pilgrim living in a crazy, contorted world, fighting to find time and energy for things that matter. I face loneliness, stress, fear, sorrow, temptation, and despair. I plead for a heart that desires God, because my heart desires lots of other things more. I long for a nature that perpetually exudes Christlikeness, because my nature is far different. That’s me. And I love to read the Bible. I love it, because I find in it everything I am searching for. Life. Answers. Understanding. Help. Hope. Peace. Joy. Truth. If you found something that had all of those things, you would love it, too. And you wouldn’t be able to let it go. And you’d constantly be wanting it. And you wouldn’t let anyone or anything take it. And you’d give up other things to spend time with it. And when that thought occurred to me as I sat at a red light, I was shocked. And amazed. And grateful. Three good reasons to tell somebody. It’s not super-spiritual, and it’s not a lie. I love to read the Bible. So grateful for your passion for this! I am grateful for it, too! None of us are perfect. I’d not consider myself super spiritual at all, but thankfully God’s Word is super spiritual 🙂 Without it, I don’t want to think where I’d be. Happy to know your love towards Bible !!! I pray I develop your love more and more each day. 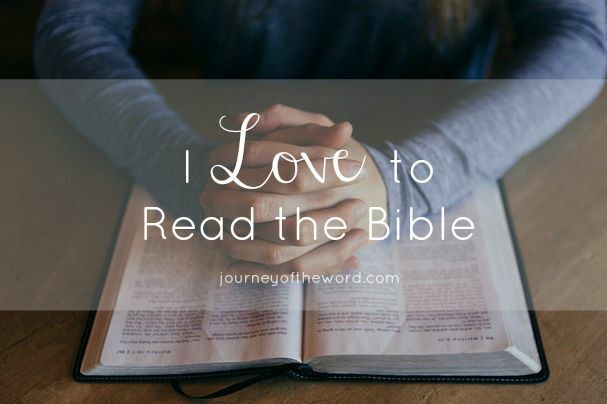 I love reading and writing about Jesus and His Word. But I do need to spend more time in the Word too. PS Thanks again for linking up with us at the #LMMLinkup. I love to read the Bible too. I am not so diligent on my own of late, but my husband and I read a chapter each night, giving us peace for the night. We are blessed to have this powerful Word of God. Thank you for sharing this. I think its wonderful that you posted this! It is absolutely amazing to share with the world that we read not out of obligation but out of love! Have a great weekend! “I love it, because I find in it everything I am searching for. Life. Answers. Understanding. Help. Hope. Peace. Joy. Truth.